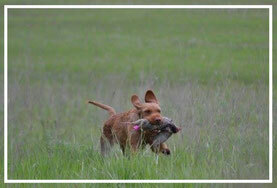 Wirehaired Vizslas (WHV) are versatile dogs. They are instinctual hunters with a natural point and retrieve. They have great noses for tracking and are keen to work. These dogs are also great family dogs and form a strong bond with their family. They are a bit protective but are gentle with kids. They are cuddlers and are loving and can be couch potatoes. Don't let this fool you though, they are a highly active dog. Their most distinctive feature is their dense wiry coat and bearded face. In our opinion, these dogs are the best! 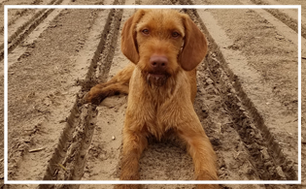 Wirehaired Vizslas are uniquely their own breed. They are gentle, loyal, wonderful family dogs. They are also known for their hunting and tracking skills. Click below for more information. Not enough for you on this site? You can find us on Facebook! 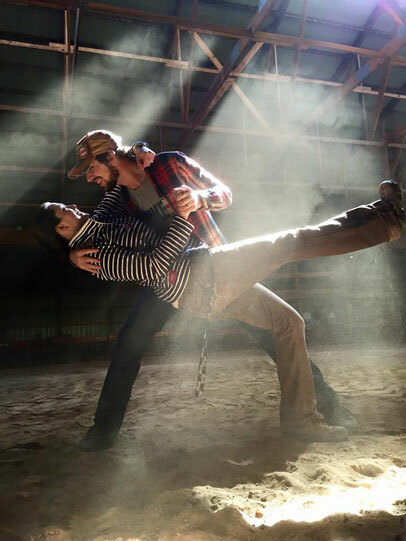 Get up-to-date info on our calendar, activities, and new pics. Check out our "Dogs and Puppies" tab. If you aren't finding what you are looking for there, please contact us! Eric and Megan Wallendal are full-time farmers and dog lovers. Both of us grew up on farms (Eric on the family farm we currently farm now and Megan on her family's Christmas Tree Farm). We both have a serious love of the outdoors and ultimate frisbee. We met playing ultimate frisbee in 2007 and we finally married in 2014. We still continue playing ultimate frisbee and our dogs are our sideline cheerleaders. They become the team mascots! We hike often in our woods, read, hunt, play board games, and are Marvel nerds. In 2011, we decided we needed to add a furry family member. We searched for a dog who could come on our adventures. A dog that could keep up on our runs, hike, hunt, cuddle, listen, handle the winter and basically be awesome. 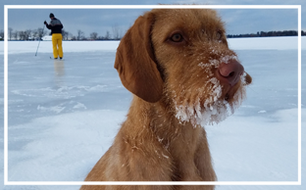 We stumbled across the wirehaired vizsla breed and fell in love. Gambit was a great addition to our little family. We searched for our second WHV in 2015 and discovered it had become even harder to find a WHV in the US. We ended up getting our second WHV, Quill, from Hungary (Zoldmali Kennels). Our love of the breed (and our dogs) pushed us to start showing Quill and form a kennel. We want to produce quality dogs that fulfill their breed standards to the highest! While we are new to the breeding, showing, and hunt competitions, we are passionate and dedicated. Brittany has trained Quill for show and handled her all the way to Westminster! Click below for her Facebook to her kennel for Aussies; Riot Kennels. Located in the Central Sands of Wisconsin, we are row crop and vegetable irrigation farmers. Check out our Facebook Page to get some updates on our farm. We are working on a farm website.